There are hundreds of songs and poems written about Hanoi in autumn, which talk about the beauty of Hanoi and I agree with these poets. 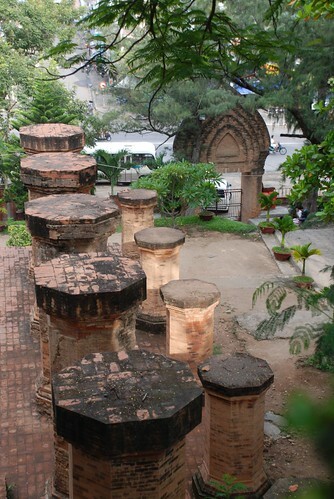 Between September and November is the best time to discover Vietnam, especially Hanoi. 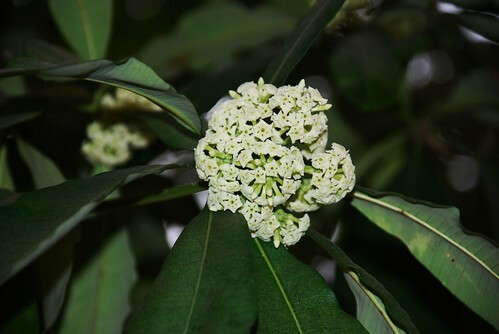 Walking along the streets and lakes and you can enjoy breathing in the beautiful sweet flavor of Hoa Sua flower(Hoa Sua means Milk Flower in English) and the willow trees hanging low. 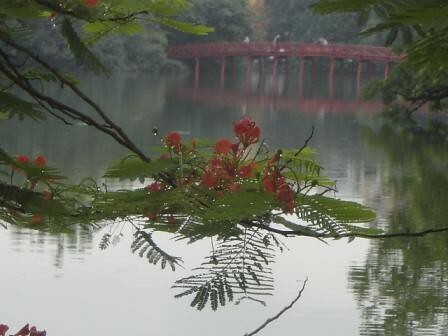 Autumn turns Hanoi into a really romantic place. It affects the people, too. 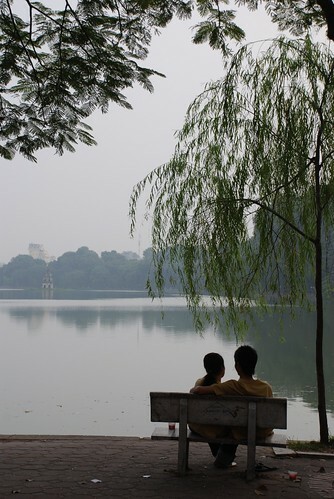 Lots of young couples walk together or sit down alongside the lakes to exchange their kisses. The weather in Hanoi during autumn is cool, a little bit sunny with a nice breeze that makes everyone much more active after the long hot summer. I love hanging around Hoan Kiem Lake and Truc Bach Lake on these days, looking at people and taking some photos or sitting down with a beer waiting for the sunset. 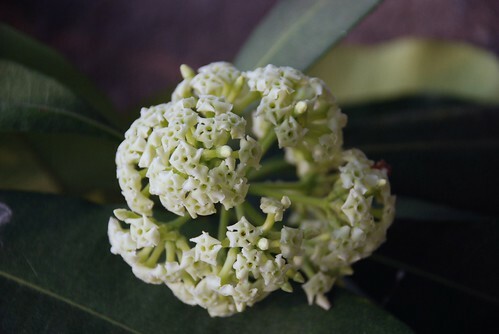 A warning - don't breath the milk flowers in too deeply as this might give you a headache. 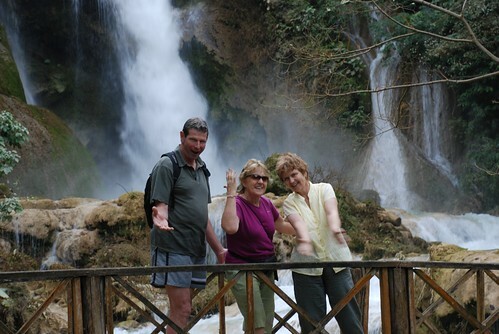 My friends and I went back to Luang Prabang, Laos for a week's break. We love this peaceful, beautiful place. Laos people are really sweet and friendly, while Laos food is unique because they cook with lots of veggies from the forests. It's a little bit spicy like Thai food. We ate Laos food everyday especially laap and spicy Laos noodles soup with pork, chicken or beef. So yummy. The soup is something I had to have every single day and I can make it now in Hanoi. I feel regret that I didn't go to the Laos vegetarian food buffet, one of the great stops for tourists and only 5000 Kip, which is 50 cents. But we ate there a couple of times last year. The shopping is great in Luang Prabang and I find it hard to keep away from the shops. 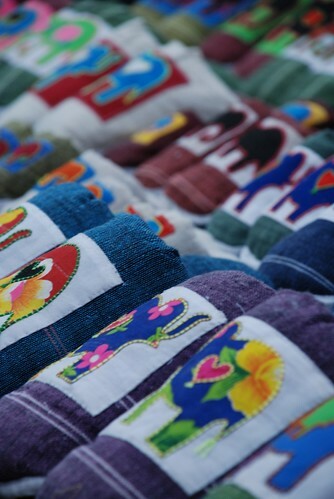 They have a very nice night market for tourists with a variety of products, from childrens' slippers to doona covers and beautiful paintings or gorgeous buddha statues. You need to bargain or you get ripped off and I always think bargaining is a game and Laos people love it too. Of course, I usually give them a little bit more after I buy the stuff. If you go to the market about 4 Pm when they start opening, then you can see lots of beautiful kids hanging around the shops, some of them sleeping on the ground and some of them helping their parents set up the business. I love the night market in Luang Prabang. We were very lucky to arrive in Luang Prang before October 1st because that date is the start of the high season, when hotels put up their prices. 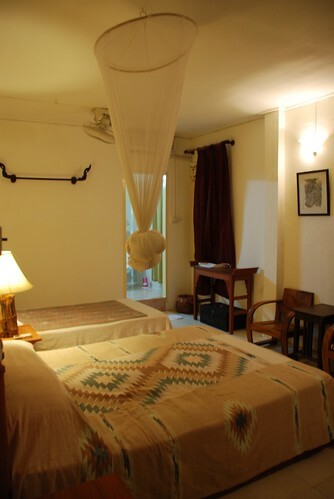 We stayed at the Sayo River Guesthouse and the room we stayed in increased from $20 to $30, but because we arrived before the changeover, we only paid $20 for the rest of our stay. 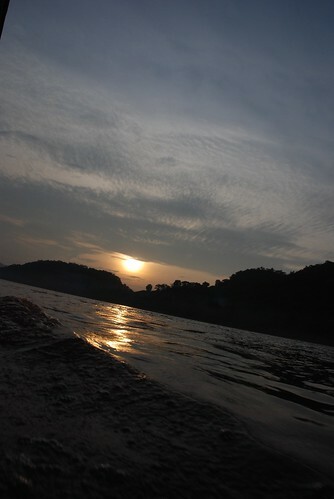 If you are planning a trip to Luang Prabang, that's worth remembering. We had such a great time travelling around by tuk tuk, on boat trips down the river to see the sunset and also joining the hotel receptionist at the local disco which was hilarious. 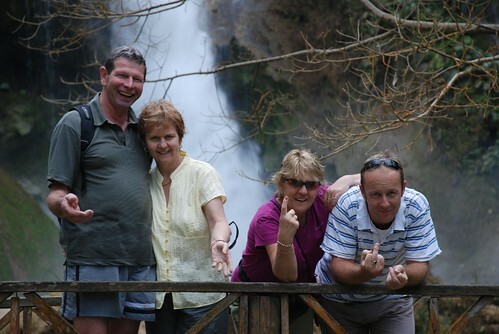 Thanks alot to Liz, Pam, Mark, Matt and the Laos people for giving me such a memorable trip. Is Fast Food Good For U? In the past two years, Hanoi city authorities have approved so many fast food shops and they are all pretty successful. Maybe I am silly for not eating this kind of food. Most of my friends love it and kids do, too. These restaurants are always busy for lunch and dinner, especially at weekends. In two months time, two more outlets are supposed to be opening in the best location in Hanoi, right next to Hoan Kiem Lake. They are Starbucks coffee and Pizza Hut. Sometimes, I wonder why people keep going to these places? The food is bad, full of oil and fat but I've realized from people I've talked to that they love eating fast food because they want to try new things and for young Vietnamese people, it's a trend. They think that's what young peole do in western countries. Is that a good idea? Not for me! I prefer eating at the local eateries or home cooked meals which are healthier and cheaper. My friends think I'm being difficult when I refuse their invitations to go to KFC for a feed. What do you think about fast food? Does it have anything positive about it? I wonder what will happen to future generations of Vietnamese? 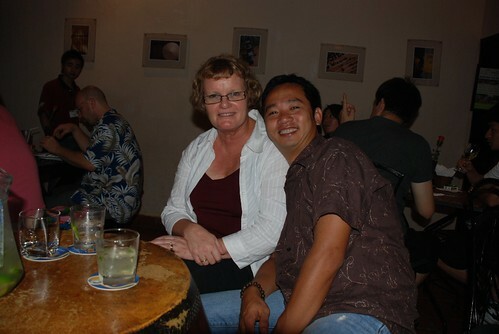 Gaylene and Eric are two of my best friends in Hanoi who I've known for almost 3 years now. Meeting them at the beginning was a funny story that. At another friend's birthday party, I was sitting in the ergonomic office chair moving around serving people drinks. I was offering them lots of drinks and we started a conversation and the rest is history. 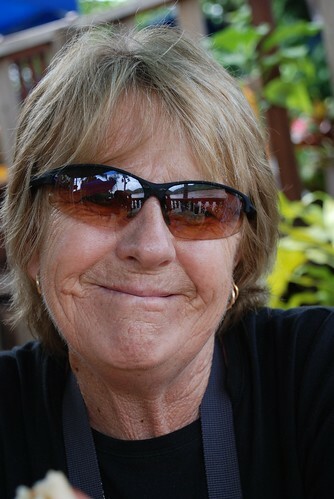 Three weeks ago it was Gaylene's birthday which involved a frustrating story. We had dinner at Wild Lotus restaurant, one of the most beautiful restaurants in Hanoi. 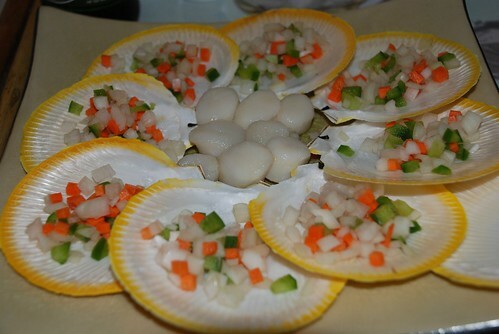 I had just arrived home from Nha Trang and had to rush to get to the restaurant on time. Just after we arrived, my friend Liz realized that she'd lost her money bag somewhere. We called the taxi company and Liz returned home to check. Everyone started worrying and I made many calls on Gaylene and Eric's phone - my phone had run out of money :)). Eventually Liz arrived back at the restaurant with a worried face and we knew this was not a good sign. Anyway, after 10 minutes, I recieved a call and we went downstairs to collect Liz's wallet from the generous taxi driver from Hanoi Taxi (04.8262626). We were so happy and Liz offered him $70 as a reward. What a treat! We had a great meal with some New Zealand wine and beers after the drama. 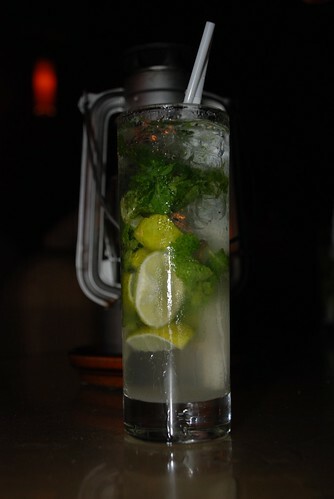 We ended up at Le Pub for another celebration with 2 jugs of mojitos, more beers and gin and tonics. Gaylene had a happy birthday and she said to everyone that she is having a good life here with good friends and a beautiful house, even though her job is a bit stressful job. 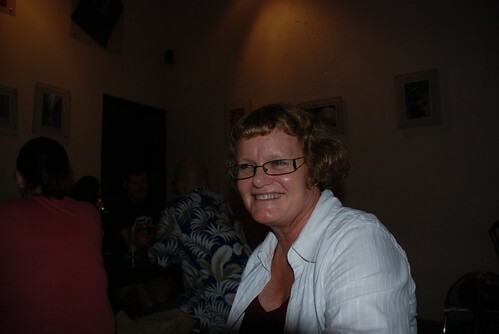 She loves Viet Nam and her and Eric have decided to stay in Hanoi for a while. Happy Birthday Gaylene! All the best with luck and happiness. PS: Sorry for updating your birthday over 3 weeks later than your special day. Recently in Nha Trang, we spent most of our time on the beach and visited some famous places in between. 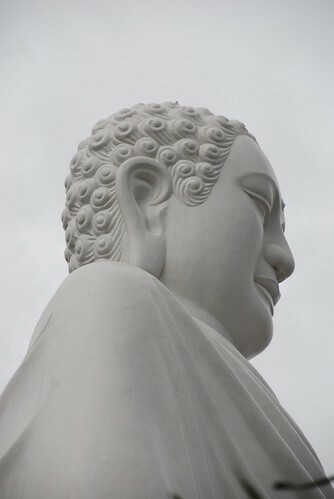 We went to Long Son pagoda where the most biggest Buddha is located on the hill. Our taxi driver drove us to the top instead of us climbing up the hill as before, a quick way that I didn't know before. You can see a really good view of Nha Trang from here, the ocean and the other parts of the city. Downstairs from the white Buddha is a beautiful reclining Buddha. I love this pagoda not just because of its beauty, but also because it reminds me alot of my childhood when my family used to come here every New Year's Eve to wish for a good new year. 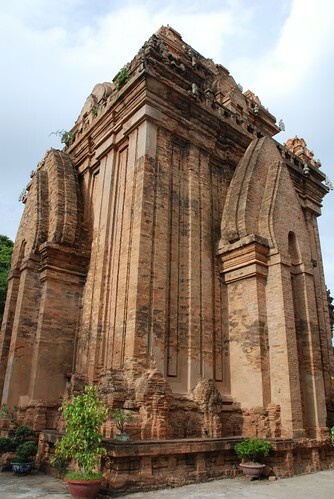 After the beautiful white Buddha pagoda, we went to the Cham Towers, the most famous tourist stop in Nha Trang. We spent more than an hour looking around and took lots of photos and of course bought some stone statues and spoke to the lady who makes sand paintings. She makes really amazing pictures inside glasses, bottles and some tiny vases. I regret that I didn't buy one painting from her but I also think it'd be a dust collector as well. We also visited the city Cathedral which is located right in the city centre. 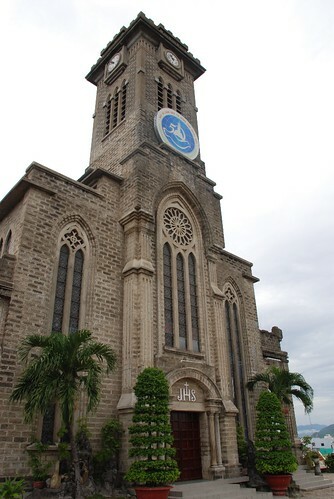 It was built by the French in 1928 and sports a grand clock on its face together with three giant bells. This is a popular stop for both tourists and locals. Most local couple come here for their wedding shots and pray for a happy marriage. Good idea, isn't it? We ended our afternoon at the Hon Chong peninsula in the fresh ocean air looking back at the beautiful long white sand beach of Nha Trang. When we were there, we saw lots of young couples and kids hanging around, taking photos of each other and diving into the sea. 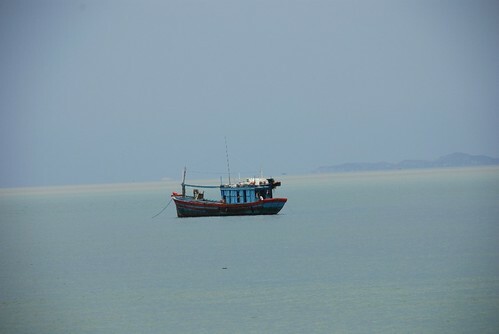 One day I hope to find a good job in Nha Trang then I can live there. Unfortunately, this trip was too short and I didn't have the chance o spend much time with my family or eat at my favourite local restaurants. 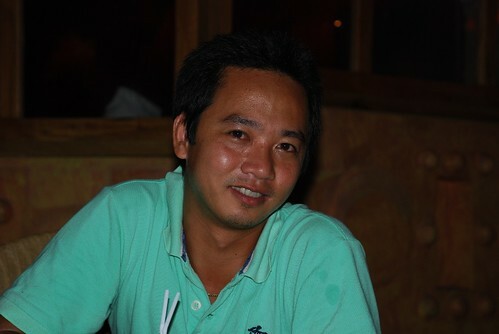 My friends loved Nha Trang and said they will be back here again in the future for sure. 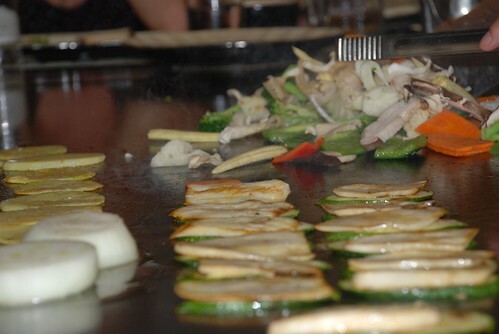 Cook and cook is such a joy and entertainment restaurant which is called “teppan-yaki” style. 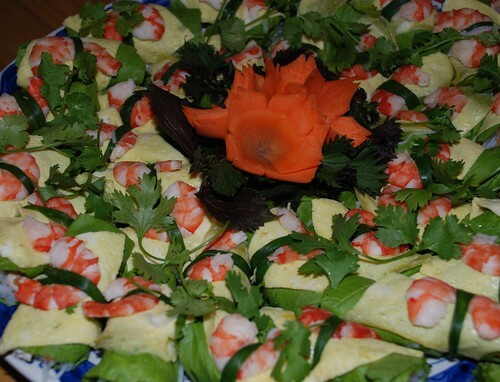 This restaurant was the first introduced to the excellent traditional “teppan-yaki” food from Korea in Viet Nam. The restaurant developed the idea of entertainment where the exciting showmanship of cook and cook chefs dazzled restaurant goes with deft cutlery skill while preparing nothing less than exquisite food. 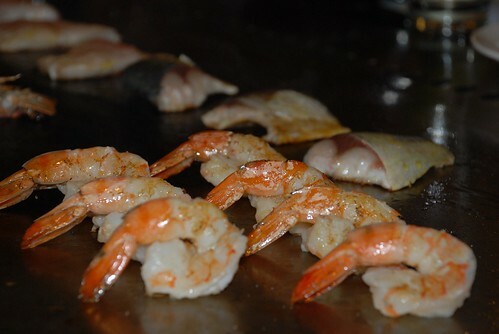 People who come here can choose up stairs for hot pot and down stairs for teppan-yaki seafood. Each table up to 8 people would place their orders with the skillful chef and watch an amazement as these items were sliced, diced and slipped into the air. There is variety of food to choose for both a la cart and set menus but my highly recommendation is go for set menus which is included more than 10 kinds of different food. Set menus from $10 to $45 for evening, for lunch from $8 to $12. My friends and I went to Nha Trang on a very early flight to make the most of only 2 days to lie on the beach and enjoy seafood. 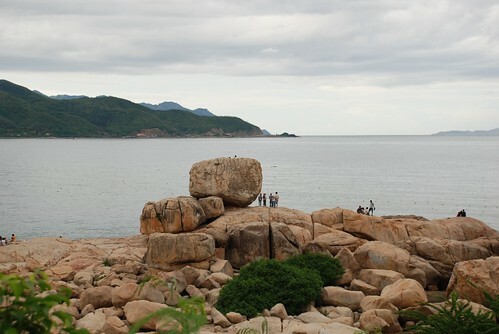 I love being in my hometown, because Nha Trang really is a great small beach city. 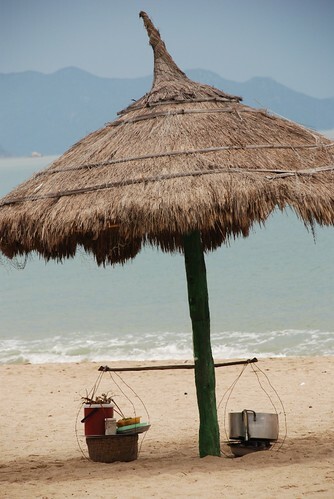 Nha Trang people are generally friendly, the food and drink are reasonably priced, and the beach bars are great. We spent most of our time at Louisianne Cafe which has a private beach and swimming pool. The staff there are so sweet and they brew great cheap beer. 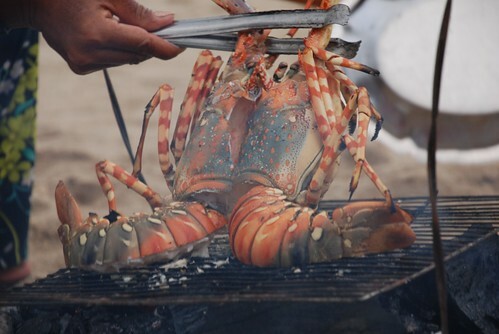 We had some grilled lobsters, crabs and sea snails from the lady on the beach, which were delicious. We had to sit outside of the cafe area because they do not allow customers to bring outside food in. Eating, swimming and drinking at the same time in such a beautiful setting with good friends around made me feel good and lucky. We finished our day at Louisianne before my friends headed back to their hotel, the NewSky(Thien Tan) hotel and I went home to get changed and ready for a wild night ahead at the Sailing Club, another great establishment in Nha Trang. Hi everyone. I've been a bit busy travelling, firstly from Hanoi to Nha Trang for 2 nights then to Laos for a week. I'm also going back to Halong Bay in an hour for a night on the boat with my friends. I hope you guys forgive me for not updating my web blog much in the last two weeks. Many good stories about my travels will appear from Friday. Holidays Rock!!! 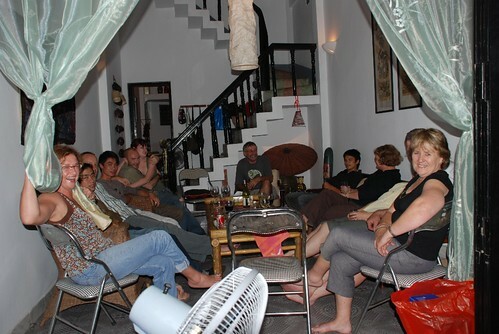 My good friend's mother came back to Vietnam for the fourth time and we decided to make a very simple BBQ party with a few friends. It was the mid- Autumn festival evening but without a full moon, unfortunately. It had been raining for 2 days due to a storm in China but it stopped just before the party. Somebody up there loves Vietnamese God! I had put up some lines of lanterns outside the house which had been taken in and out a few times so they wouldn't get wet and ruined. I remember the last time I had a BBQ party and the rain ruined all my paper lanterns which I spent a whole day making but I was lucky this time. I asked my ex-colleages to prepare some food for the party and it was really good. We had tiger draught beer, two different kinds of fresh spring rolls, lotus salad, mango with duck salad, together with beef and chicken on the BBQ. Some of my friends came with some desserts, fresh fruit and wine which was nice. 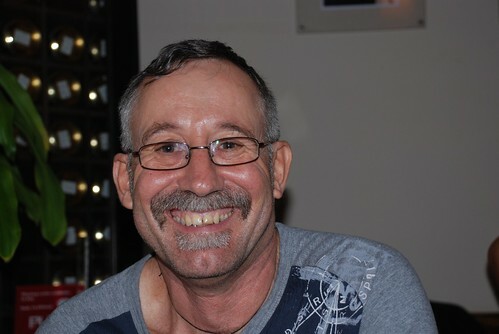 It was great to catch up with friends and everyone seemed to have a great time. It was quite a late night but nobody seemed to be too drunk, probably because it was a Tuesday night and there was work the next day. Sometimes a mid-week party is good and it's nice not to wake up with a hangover!